Do you entertain guests or travel with family or friends? If so, a front bathroom floor plan may be best for you! 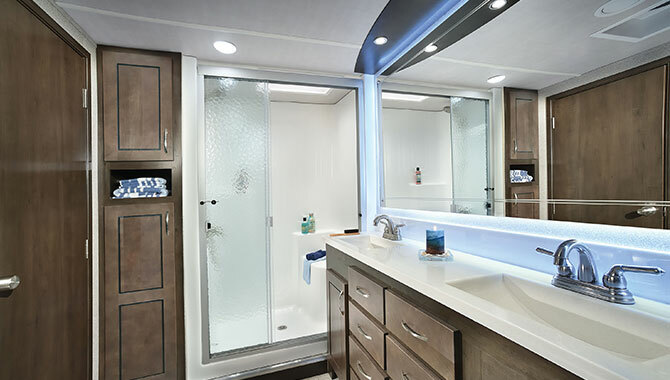 This RV layout allows for more privacy in the master suite by allowing easy access to the bathroom at the front. Front bathroom floor plans locate the bathroom suite in the front of the RV. This allows access to the bathroom from the living area instead of from the bedroom and provides more privacy. This is a convenient option if you entertain guests often or travel with multiple friends or family members. A front bath may also be part of a bath-and-a-half floor plan, meaning that one bathroom contains a sink and toilet (the half bath, located in the front of the RV) and the other bathroom provides a shower, sink, and toilet (the full bathroom, usually in the rear of the RV). Many types of RVs offer the front bathroom floor plan, including travel trailers, 5th wheels, and destination RVs. 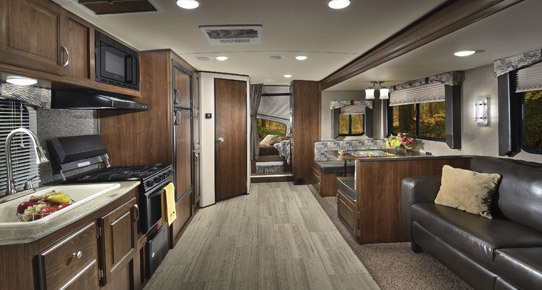 Shop our online selection of RVs with front bathroom floor plans at your convenience or visit our dealership to see your favorite models in person.